There are 30 squares of all sizes in a 4x4 grid of 40 matchsticks. "What is the minimum number of matchsticks that need to be removed to leave no squares of any size?" Problem #12 in the book shows 24 matchsticks formed into a 3x3 grid and asks about the fewest sticks that can be removed to eliminate all complete squares of any size. Actually one solution is given and the real question is "What is the minimum number of matchsticks that need to be removed to leave no squares of any size?". This program will not tell you directly, but will let you play around by adding and removing sticks from the grid with feedback at each step about the number of squares remaining. # of matchsticks removed for a zero square solution. It's easy to get values for 1x1, 2x2, and 3x3 grids and the program will provide values for the Matchstick and Square counts for larger sizes. Surprisingly, all three sequences exist and have names in the OEIS library. A search on the first few terms will find them with an large amount of additional detail. Data Structure was tough design because most of the referencing is the edges of the grid but most of them share a vertex one, two or three other "matchsticks". I ended up with an array (Vertices) of TVertext records representing top left corner of a cell. Each TVertext record contains two TEdge records, labeled H for horizontal and V for vertical direction. Each TEdge record has a TLine record with the start and end coordinates of the matchstick, a direction field (East or South), and a Boolean Exists flag to tell whether the stick is present. The rightmost H record and the bottommost V record have direction set to Unknown to prevent checking nonexistent edges. Detecting matchstick clicks uses the MouseDown event exit which scans all edges using the NearestEdge function to return the intended edge. A simple Exists:= not Exists; statement then reverses the edge state and a call to DrawEdge redisplays it. Drawing matchsticks instead of just red or gray lines was a late addition and required lots of time to get the scaling even close to correct over multiple grid sizes. A Cellsize value is calculated based on image size and specified number of grid rows and columns. The length of each matchstick is based on Cellsize value, allowing a little space at each end of the stick. Matchstick width (MsW, match head width (MhW,) and match head length (MhL) are all trial and error values based on cell size. 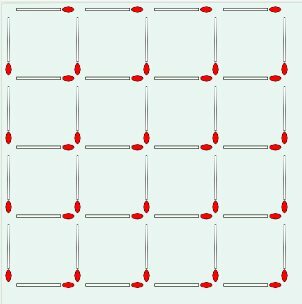 Each match is drawn as a red ellipse for the head and a rectangle for the stick, overlapping the head slightly. Counting and reporting matchsticks removed is trivial; check edges in all vertices and count those with Exists=False. Counting all remaining squares was not so simple. A IsSquare function checks the perimeter of each passed top left vertex and size from current column and row to the right and bottom edges If any is missing a matchstick, that combination is not a square. For Version 2, it took a while to figure out the best way to view remaining squares in larger grids. Highlighting matchstick was not useful for large grids (with small matchsticks). Solution was to use the TCanvas Copyrect method to save the grid image to a bitmap before highlighting a square whith a solde rectangle and then restoring from the bitmap after a 1.5 second delay. Save and Restore were implemented as dialog units which save and restore grid configurations in configuration file HowManySquares.ini. Grid names are used as Section names, Two digit strings contain vertex column and row as Key names, and two character Value strings: __, H_, _V, and HV. to identify presence or absence of matchsticks from that corner. It works fine and saves creating a file for each grid saved. January 28, 2016: It did not take long to recognize the need for for the first two enhancement suggestions. Version 2.0 adds the ability to view remaining squares after each move or on request. Also grids can now be saved and restored in configuration file "HowManySquares.ini" Both features are helpful when working on larger grids. Incidentally, I didn't get to documented it within the program, but the optimal solution for an N x N grid removes N*(N+1)/2 matchsticks. Ceiling(N*(N+1/2))/2) matchsticks where Ceiling(X) is the smallest integer greater than or equal to X. SO the new best solytion for the 4x4 grid is Ceiling(4*(4.5)/2)=18/2=9 instead of the old target of 10. If you can't find it, for a $2 donation, I'll send you the 9 toothpick solution and split it with the fellow that sent it to me. I'm so confident of the new targets that I'll donate $10 to the first person to send me a 5x5 solution less than 14 toothpicks, or a 6x6 grid solution less than 20. Implemented Jan 28,2016: Add ability to show remaining squares. Count of squares is currently displayed but finding them is not always easy. Implemented Jan 28,2016: Add ability to save and restore grid configurations. Check non-square grids. The capability exists but has not yet tested.